Announcement Looking for art for a boy or girl's room? We have giraffes, frogs, sailboats, fish & other fun, creative art for a children's room or nursery. Browse our selection of originals, limited editions and prints, plus other unique gift items like cards. Items can be custom made for you. Simply contact us here for more information. Please note currently turn around times are 3-10 days. Nervous about shopping online? In order to ensure the safety of this piece during shipping, all original and limited edition art work is professionally packaged and shipped via UPS or Fed Ex. I create artwork in my own unique style that is my own. My copy, photos, artwork and products are all copyrighted and are my personal property. Please to not use images without consent and please keep originality in mind when creating your own art. For this reason I will not entertain requests to copy another artist's work. Thank you for stopping in. Have a wonderful day! Looking for art for a boy or girl's room? 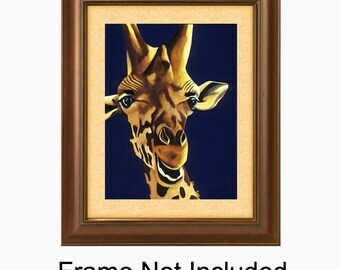 We have giraffes, frogs, sailboats, fish & other fun, creative art for a children's room or nursery. Browse our selection of originals, limited editions and prints, plus other unique gift items like cards. Items can be custom made for you. Simply contact us here for more information. Work in progress picture of my Frog Prince painting. Final picture of my Frog Prince painting. How did this shop come about? Honestly, I was sitting at The Sawdust Festival in Laguna Beach, it was pouring rain for the second weekend in a row. The rain was so bad, they actually closed the show for the day. And I thought to myself, there has got to be a better way to share my art with the world. One that isn't dependent upon the weather, and people's ability to come to a show. The next day I listed a couple pieces of art on my new Etsy shop - and sold two pieces that night! To people I knew, but who had never been able to come to an art show, because they didn't live in California. So I decided to put some of my attention on a shop here on Etsy. And I'm glad I did. Since then I have been able to share my art with collectors, not just in the United States and Canada, but also the UK, Europe, Asia and Australia. How does it get better than that? 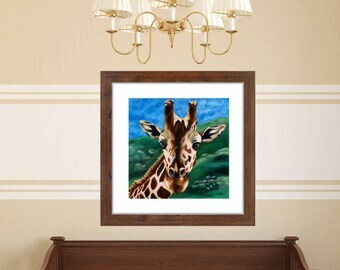 (I also have my giraffe paintings in Africa, but that's another story.) So my art has now seen much more of the world than I have, and I think that's pretty cool. All because an art show in Sunny California got rained out. Have you ever met a giraffe? I did and instantly fell in love. And so I started painting giraffes, and then decided to expand to other topics children & the young at heart could connect with. Hello! My name is Billie. I am a full time artist who loves to paint colorful, happy paintings. (You can also find a Contact Owner Link Under my picture on the first page of my shop.) As I do love creating custom paintings for people.